This weekend I will be laying out a couple food plots and hopefully start disking, spraying, disking or whatever in prep for seed. I am curious what everyone else has planned for your spring plots. Also, my areas are thick long grass that is mostly laid down from winter. I don’t think I will be able to burn, so what should I do to prep those areas? Do I just mow it up as much as possible and then disk it and spray or spray first then disk? I usually mow it down then make sure there is some green growth before I spray, then till it in a couple weeks later. Not sure if this is best, but seems to work good. The deer just didn’t hit the beans very hard this year so I will till in the leftovers and let them sprout and till again before I replant those plots - this way I’ll kill off all the volunteer beans as I think they retain their round up ready status. Matt, It sounds like our ground is covered in the same stuff, and I was curious also about either burning or mowing and tilling. So BIGPOND, thanks for the advice! I think we will be planting 1/2 clover mix and then 1/2 sunflowers for the birds. I would still try to burn it…When it is laying you actually get a better burn off than loose standing…How big of areas?..Is it safe to get a controlled burn?.. 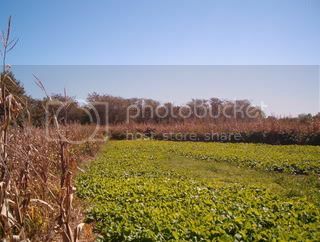 I will put in some winter wheat and turnips later in the summer. I have a total of about 18 acres thats tillable but the only thing growing in it is tall praire grass and juvinille cedar trees. 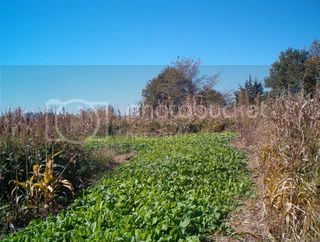 I would love to convert some of it to food plots but heard it can be pricey and u need to know someone who can disc your ground and what not….i have the land and the energy and can spare SOME money to do it but need some direction/help. anybody out there? Well thats not a bad idea….I wonder how exactly that works….you pay for the seed and they come out and till it up for you for a small donation or is there a min donation..
where you located at? I have all my equipement down in schuyler county if your anywhere near there. If the grass is still brown, just mow, then disc… no sense in wasting the herbicide. of course if its green, mow, spray disc, etc.. I just mowed mine down 2 weeks ago, went out this past monday, and disced the heck out of it. gonna do it one more time to really make sure its all gone in another week or so. I will then plant my rr corn, eagle bean, milo mix. I plant these in a like a half wagon wheel pattern, then do clover and brassicas in between the strips of c/bm. 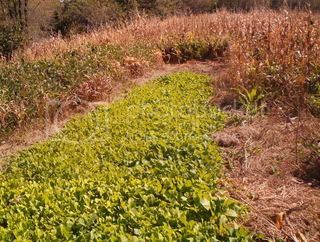 this creates nice shooting lanes from my tree stand, and allows me to sneak into my stand using the higher corn for concealment. heres some pics how i did it 2 years ago. 8ball, welcome to the forum and thanks for the offer. This plot is in Knox county.